Tagged under Kobuichi, J.C. Staff, Light Novel, Series. I particularly like Aria, she reminds me of the palmtop Taiga in Toradora which I think is very cute. Sometimes I feel sorry for Shirayuki because she is like a devoted wife to Kinji, always so caring and obsessed over him but get snatched away by the awesomeness of Aria Holmes. In one of the episode I started to fall for her when she wanted Kinji to do her or something and she look so innocent and that gave me a blood rush. Reki, the sniper, is one of my fav, her cool style combined with her awesome sniping which I think is just awesome. Riko is a perverted Otaku and she is a very interesting character, very good at gathering information for Kinji and always into seducing and teasing him. This anime is eye-catching and got style. I could care less about Aria. She's one of those types of characters I despise. That personality is like Shana from Shakugan no Shana, Haruhi Suzumiya and others I can name. They are called tsuderes I believe so those types I despise most of the time. The other characters I like especially "Holmes". Not a bad series. If you despise tsuderes, stay away. I'm watching this because I saw it on a blog that I use for anime and the plot seems really interesting. I just finished watching the first episode and Aria's attitude is very funny, I also thought it was funny when she showed up at his house with a suitcase saying: be my slave. What a thing to say to some one when you just show up, barge into thier house and make yourself at home. Watching Aria gets flustered so much over Kinji was cute. Shirayuki was just a completely annoying character to me. Though she was an expected character type; the childhood friend with feelings for the main male character, Kinji. The girl's feelings towards Kinji can't even be called jealousy. Shirayuki acts like a stalker, seeing as she tried to murder Aria when Shirayuki found out she was living with Kinji. I didn't like her. I liked Reki, I wished they showed her more. Riko was okay. Her past with Vlad was pretty mesed up. I didn't expect Sayonaki to be the vesel for the bad guy, even though there were moments when he acted suspcious, so I did know he wouldn't turn out to be a good guy. seiyuu of two mains worked together before, performance this time more or less equal to tiger x dragon performance. story rather interesting having borrowed various elements from other anime/manga. action packed together with love elements making this quite enjoyable. artworks very high quality especially all the guns and bullets fighting scenes. hope there's season 2. In future near future, there were humans that were a little more stronger then normals. There was a special school for them. A school which was go guid them to become a BUTEI. BUTEI are concidered as Special forces and at the end of the training one BUTEI was concidered to be strong enough to handle more terrorists then a bunch or two. Brilliant presentation and voice acting. Liked the story as of no other anime. Hopegully i will get to see another season (full season this time) soon. 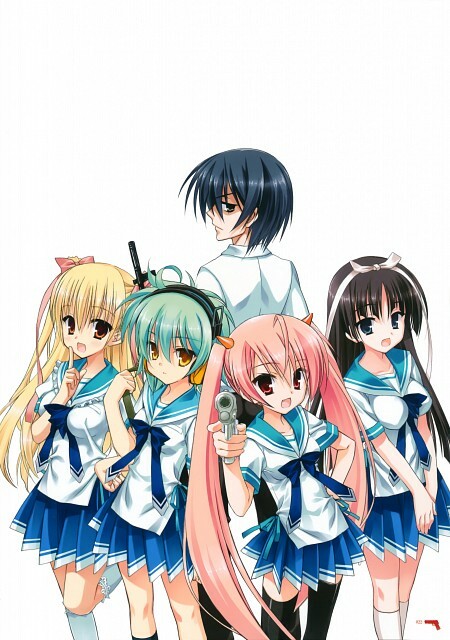 No feedback on Hidan no Aria.